There’s a sharp new twist in the story of American poker pro Gordon Vayo’s lawsuit against PokerStars over nearly $700,000 in frozen winnings from a Vayo victory in a Stars Spring Championship of Online Poker (SCOOP) event in 2017. 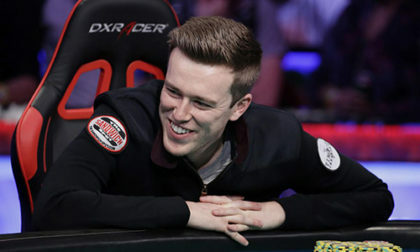 Among the latest developments are the voluntary dropping of the initial California-based action by Vayo, a switch in legal representation by Vayo, and a recent filing by PokerStars parent Rational Entertainment Enterprises Limited (REEL) regarding Vayo’s alleged intentional falsification of evidence to support his claim that he played in the SCOOP event from Canada. PokerStars froze the roughly $600,000 that Vayo still had in his account after evidence arose that Vayo wasn’t in Canada, but instead was playing from the US via a VPN, or virtual private network, in contravention of PokerStars’ terms of service. The United States (excepting New Jersey on a separate, standalone site) is a banned jurisdiction, and players are forbidden to play from the US. Vayo’s lawsuit, in part, attempted to force PokerStars into a US-based court to deal with the matter, while also claiming that Stars’ international base in the Isle of Man took exceptional advantage of an unfair and archaic legal system to shield itself from modern “Western” law. … When REEL withheld Mr. Vayo’s winnings from an online poker tournament based on REEL’s conclusion that Mr. Vayo was playing from inside the United States, Mr. Vayo first sent REEL purported evidence that he had played from Canada, and then sued REEL to recover his winnings (claiming in the process that REEL’s user license agreement should be nullified). But Vayo’s “evidence” was forged, and he had used it to attempt to defraud REEL and this Court. … Not yet knowing that Vayo’s “evidence” was fraudulent, REEL filed a Motion to Dismiss for Lack of Personal Jurisdiction and, in the alternative, Improper Forum. Vayo’s Opposition to the Motion to Dismiss attached and relied upon his December 4, 2017 letter which had attached the forged records—though (in retrospect, tellingly) the forged records themselves were omitted. [document reference]. After the Motion to Dismiss was fully briefed, but before it was heard, REEL received a “tip” from a third party that Vayo’s bank and internet records were altered by a document forger Vayo hired (the “Forger”), specifically in order to create the false impression that Vayo was in Canada during the SCOOP Tournament so he could fraudulently demand payment from REEL. Stern ]. As described below, REEL’s further investigation confirmed this to be the case, and REEL immediately confronted Vayo about it, on a Friday evening. Vayo’s counsel claimed that he was not aware of any forgery (i.e., he had just passed along the documents Vayo had provided to him), that he would ask Vayo about them, and that he was concerned about speaking further because—if the documents were in fact forgeries—the crime-fraud exception could apply. About 48 hours later, on Sunday evening, Vayo filed a notice of voluntary dismissal of all of his claims (Dkt. 31), and his counsel subsequently withdrew (Dkt. 35). REEL made repeated efforts to meet and confer with Vayo’s new counsel to avoid the need for this motion, including by sending a detailed letter explaining Vayo’s forgery. [document reference]. Vayo ignored these meet and confer requests, and never denied the forgery. The third party who informed REEL of Vayo’s forgery said that he (the third party) had spoken to the Forger. Stern Decl. ¶ 25. The Forger told the third party that Vayo contacted the Forger for assistance creating a virtual private network (“VPN”) for Vayo to use while he was playing on REEL’s site in California to create the false appearance that he was in Canada. The Forger also provided the third party with the original statements from First Republic Bank and Bell Canada that Vayo had sent to the Forger to doctor so that they would demonstrate (falsely) that Vayo was in Canada during the SCOOP tournament. Id. Importantly, the third party knew and volunteered that Vayo’s forged documents purported to be from Bell Canada and First Republic Bank, information that was not public at the time or provided to the third party by REEL. This section then inserts images showing the alleged forgeries in fraud, including at least five purported ATM withdrawals from machines in Ottawa, CA, though the miscellaneous ATM fees didn’t match to what should have shown in the connected account overview. A different statement overview starts with a large five-figure balance and ends with a similar, five-figure negative balance, despite the lack of transactions that could have sent the account into the negative. The fact that Vayo’s statements are forgeries is even clearer when Vayo’s statements are compared to the originals received from the third party. It is clear that the Forger started with Vayo’s original statements that show a long list of California-based transactions for the original timeframe, swapped out those transactions for a list of transactions from a Canada-based bank statement, and then adjusted a few other digits throughout the statements. The filing includes numerous visual examples of forgery, comparing both the original and altered statements. Flushdraw chooses not to publish these at the present time, yet may in future pieces. Nonetheless, Flushdraw has examined the filings and these images and can confirm the cited differences and apparent forgery involved. … REEL is thus the prevailing party in Vayo’s frivolous lawsuit, and it is entitled to recover its fees and costs pursuant to (1) the Court’s inherent authority to sanction bad-faith conduct; (2) the terms of the contract on which Vayo sued, which require Vayo pay REEL’s fees in these circumstances; and (3) Isle of Man law, which governs this dispute and as a general rule awards fees to the prevailing party. REEL’s motion should be granted, and it should be awarded $279,347.40 (plus whatever it spends related to this motion), the reasonable amount of its attorneys’ fees; as well as $8,641.08, the nontaxable costs REEL has incurred to date (REEL seeks taxable costs in a separate application). Such a financial hit against Vayo, if ultimately affirmed by the court, would deal a sharp blow to online poker players who believe they can play on sites in violation of those sites’ terms without risk; VPN usage for such purposes has always been illegitimate, and forgery to cover such play is certainly illegal, if indeed the counter allegations made by REEL and PokerStars are true in their entirety.